Consortium for Street Children are proud to announce new corporate partnership with leading global law firm, Baker & McKenzie. Leading international law firm, Baker & McKenzie, will partner with the world’s only global network of street children’s organisations, Consortium for Street Children (CSC), over the next three years. This announcement was made by Angela Vigil, Pro Bono Partner and Executive Director at Baker & McKenzie, on behalf of its new global and first British Chairman, Paul Rawlinson, at a reception in the House of Lords with the charity’s Patron, Rt Hon Sir John Major KG CH. 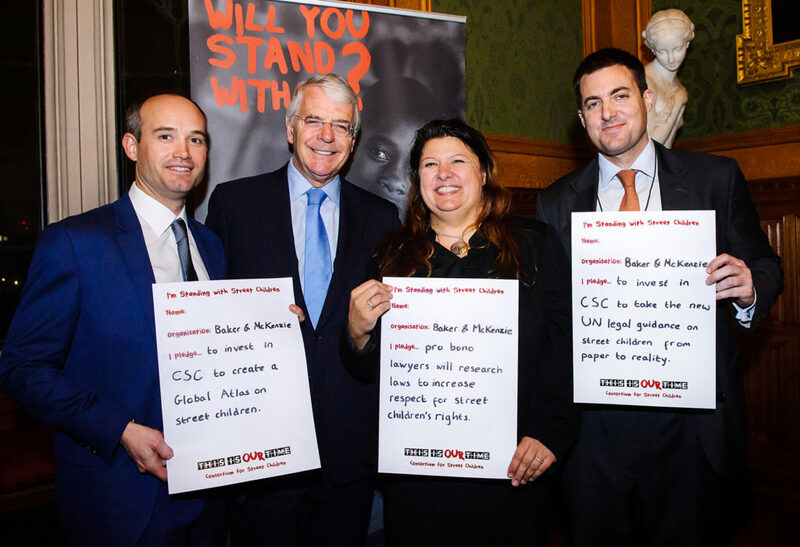 CSC Patron and former UK Prime Minister, Rt Hon Sir John Major KG CH, receiving generous pledges of investment and pro bono legal expertise from Baker & McKenzie (l to r): Ed Poulton, Angela Vigil and Nicholas O’Donnell. Baker & McKenzie will partner with CSC through investing funds as well as pro bono legal expertise. The firm’s donation will help make street-connected children visible on legal and policy agendas. In particular, CSC will be able to create global awareness of the forthcoming landmark – the United Nations General Comment on Children in Street Situations, the first ever international legal framework to protect the rights of street children. Baker & McKenzie’s donation also enables CSC to provide technical expertise to ‘early adopter’ countries, who want to pioneer implementation of the General Comment. Baker & McKenzie, together with its corporate clients, will provide unparalleled pro bono legal expertise to develop the world’s first ever Global Advocacy Atlas on Street Children, which will collect and share information on laws, policies and ultimately numbers of children in street situations. “We learned that the UN and CSC wanted to make sure that street children’s voices and experiences informed the General Comment. We decided to mobilise with our corporate friends – Cargill, Merck, Regeneron and Salesforce – and together we did something that no one else has ever done on any meaningful scale. We asked hundreds of street-connected children in four capitals of the world what they wanted. These are the world’s most marginalised children – and we listened to them. That’s a first. This unique corporate partnership was recognised by American Lawyer at its Annual Global Legal Awards as Pro Bono Research Project of the Year.